Chicken, Zucchini Pasta Salad, Thyme for Cooking gourmet summer salad. 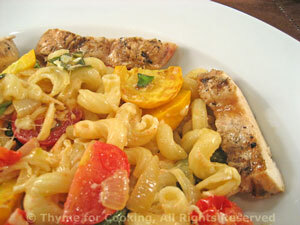 This is a warm pasta salad, full of garden vegetables and topped with grilled chicken. Make marinade and spoon over chicken. Let marinate for 10 minutes. Cook on barbecue grill for 8 - 10 minutes per side, turning once, or until done. Cut onion in quarters, then slice. Mince garlic. Roughly chop pepper. Cut squash in half lengthwise, then slice. Heat oil in a large skillet. Add onion, pepper and sauté until tender. Add garlic, squash and sauté until squash starts to brown. Add tomatoes and pasta, heat through. Slowly whisk in oil and whisk until it emulsifies. Put pasta into a large serving bowl, add basil, vinaigrette and stir gently. Top with sliced chicken and serve.